I admit I was worried that this series had started to run out of steam after reading the tenth installment, Bite Club, but I’m happy to say that the latest Morganville book put my mind at ease. Last Breath offers lots of surprises, reveals, action and emotion that make it one of the most satisfying of the series so far. 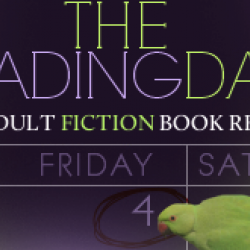 Literally no one is safe this time from Morganville’s latest threat where the twists just keep coming. 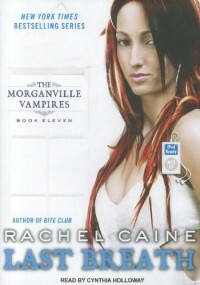 I couldn’t have predicted any of the events that occurred this time around, and I love that Rachel Caine is taking so many exciting risks with her characters and providing such a juicy storyline this late in the series.This time around in Morganville there’s a new threat that even has the vampires scared. Vampires are disappearing left and right and Amelie fears that the dreaded enemy that has hunted them for years has finally found them. It’s interesting to learn about this new threat and what makes it so powerful and lethal to everyone in Morganville. Claire, Shane, Eve and Michael are facing a huge challenge, and I was holding my breath to see how they would come out of it. Through multiple narrations of Claire, Michael, Eve, Shane and Amelie, we get more character reveals that give a new insight into our favorite Morganvillian’s. There is also plenty of Myrnin as well and he plays a key role in this book.The characters go on quite a journey this time around. And the relationships they have built with each other and the other members of Morganville really make the events that occur that much more touching and meaningful. There is just the right amount of time spent with each character to move the story along and keep things interesting. The beginning of the book really threw me off track with how I expected the story to go, and the action just kept ramping up. There are plenty of emotional and romantic scenes though that balance out the drama and suspense. In fact, some of the biggest insights and vulnerabilities of the characters are revealed this time around.This is the third installment I’ve read via audiobook, and I think this is now my favorite way to experience this series. The narrator, Cynthia Holloway, does an expert job with the characters. From Myrnin to Amelie, Claire to Shane, all of the character voices are distinct and believable. They match up very well to the character voices in my head, and the narration conveys the appropriate amount of emotion and intensity. I don’t think I can go back to the printed version of the series.I eagerly await the next installment, Black Dawn. There will be fifteen books in the series in total, and after this game-changing book I can’t wait to see where Caine takes the story next. Black Dawn is due out in May 2012.